One fascinating item in our collections is a scrapbook put together by the matron at Gledhow Hall hospital during the First World War. Officially entitled ‘The Great European War’ the scrapbook consists of photographs, newscuttings, letters and ephemera relating to life in the hospital between 1915 and 1919. Gledhow Hall at the time of the outbreak of the First World War was the home of Lord Airedale, Albert Ernest Kitson. 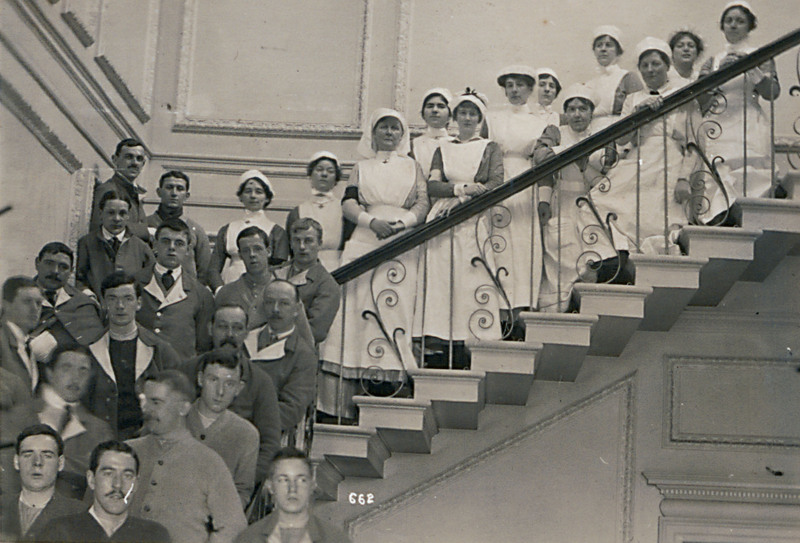 In April 1915 he offered Gledhow Hall as a Voluntary Aid Detachment (VAD) hospital. Edith Cliff, a cousin of Lord Airedale became the Commandant. The hospital opened on 22nd May 1915 managed by the Headingley Company of the St John Ambulance (Voluntary Aid Detachment) transferred from Cookridge Hospital. On this day the first 50 patients were transferred there from the 2nd Northern General Hospital, Becketts Park from which it was affiliated. In addition to Miss Cliff the staff comprised Mrs Florence Kitson, Honorary Secretary, Miss K. Sykes , Quartermaster; and Dr Eustace Carter, Medical Officer. 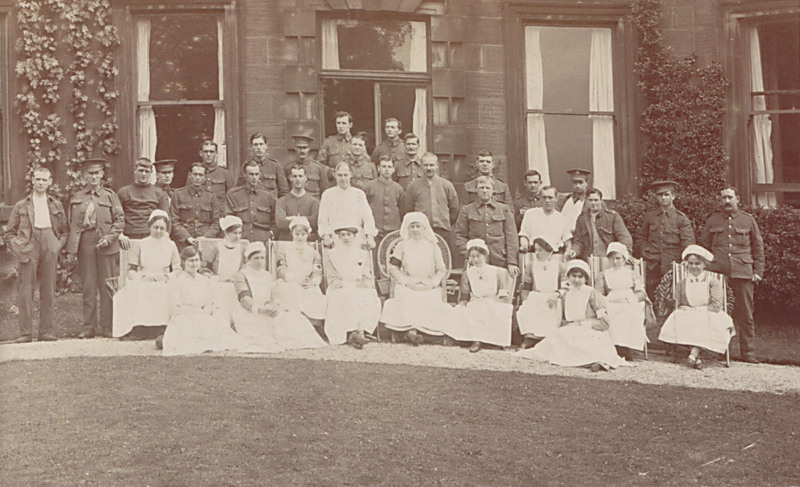 There were a further 12 VAD nurses who did the work of ward and surgery sisters, parlour maids and house maids, two trained sisters and 3 servants. 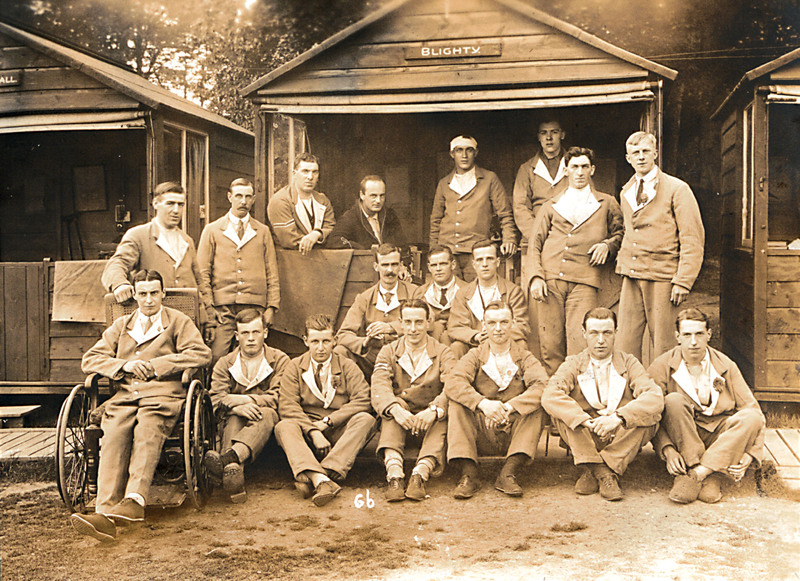 The rehabilitation of the soldiers and their welfare was paramount at Gledhow. 7 huts were established in the grounds for the worst cases with two beds in each hut and a radiator between. 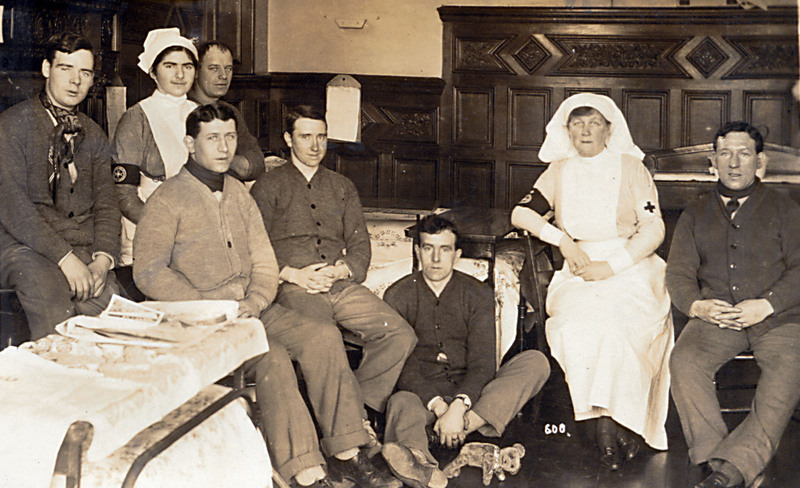 In making this provision it was noted in William Herbert Scott’s ‘Leeds in the great War’ Gledhow was ‘one of the first if not actually the pioneer, among VAD hospitals’ for this treatment. Particular attention was paid to amusements and entertainments with the garage converted into a billiard room, silver cups were awarded for competitions by ward teams, there was also a cinematograph on site and a canteen furnished like a dainty café. Sporting activities were encouraged with cricket, bowling and croquet available. 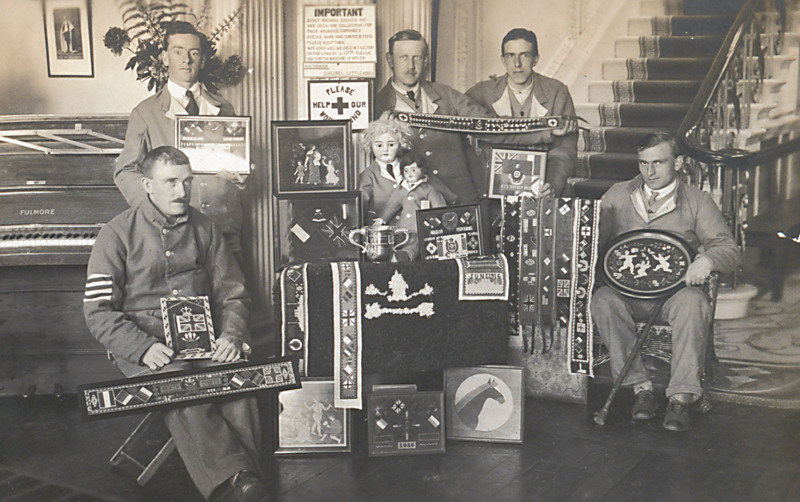 There was also considerable involvement in drama and concert performances both for the soldiers to enjoy and to be involved in as well as creative writing and poetry being encouraged.. A key feature was also the craft and needlework activities with belts covered with cross stitches with flags and regimental badges as well as elaborate pictures of animals and figures. An Arts Council funded project has been working on the scrapbook with different groups to get their reaction to it and to create a digital record. The Leeds project is one of 10 national projects working to create a Digital War Memorial to commemorate the First World War on Historypin, this will be launched on 4th August. The Gledhow scrapbook forms a central part of a new exhibition ‘Aspects and Images of Leeds in the Great War’ which runs from 28th July – 28th September 2014 in the Central Library, Arts Space, 1st Floor. You can also see images of the scrapbook on our Flickr site.